The Abbey was filled with activity in September. See Abbey life photos. Thankfully, the smoky skies dissipated as the cool autumn air arrived. 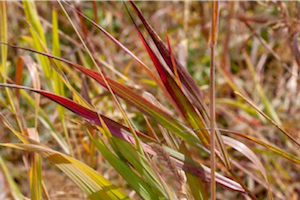 Blue sunny skies and rain alternated, reminding us of impermanence, as did the autumn colors that were just beginning. This harmonious retreat allowed participants to settle into silent contemplation in the Abbey’s beautiful natural environment. About 50 people, including Abbey residents, attended our annual Labor Day Concentration Retreat, led this year by Ven. Sangye Khadro. Venerable Khadro shared many sources from Buddhist scriptures as well as her personal experience when she explained how to approach concentration meditation. Her clarity and focus set a good example of continuous practice in concentration, and everybody gained many skills to apply in everyday life to improve concentration through constant effort. Watch the teachings here. Retreat photos are here. 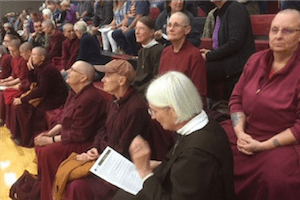 We joyfully welcomed the Seventh Ling Rinpoche for a two-day visit to the Abbey that included teachings and a public talk at North Idaho College (NIC). 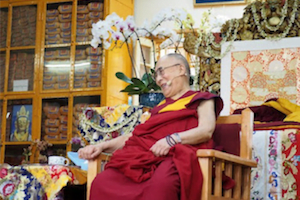 A clear and compassionate teacher in his own right, Ling Rinpoche is the reincarnation of His Holiness the Dalai Lama’s senior tutor, who was also Ven. Chodron’s ordination preceptor. Rinpoche has followed the Abbey’s activities from afar, and we were happy to share our practices and facility with him. He seemed very pleased with what he saw here. About 30 people greeted Rinpoche when he arrived at the Meditation Hall. Ven. Tarpa read a letter from Ven. Chodron explaining her absence—she was attending interviews with His Holiness the Dalia Lama in India. Ven. Chonyi then welcomed his visit by noting our connection with the Ling Rinpoche lineage: The Abbey exists in dependence upon the Sixth Ling Rinpoche having given monastic ordination to Ven. Chodron in 1976. The next day, Rinpoche gave a commentary on The Song of the Four Mindfulnesses , a text by the Seventh Dalai Lama that the Abbey community frequently chants after lunch. Around 100 people came to hear his clear exposition on practicing mindfulness of the spiritual mentor, of great compassion, of our potential to attain a divine form, and of the view of emptiness. Watch the teachings here. Rinpoche also spoke highly of the Abbey and of Ven. Chodron. 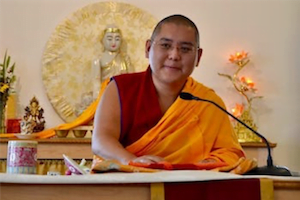 “She has been a very committed disciple of the previous Kyabje Ling Rinpoche … Next time I come here, I very much hope that she will be here!” Read about his visit and further remarks here. On Thursday morning, Rinpoche gave a public talk, “Where Cultural Identity and Interdependence Connect,” to about 75 people at North Idaho College. Rinpoche emphasized the importance of bringing compassion forward as an essential human value. (The talk is here.) Following a lunch offered by CdA Dharma Friends, we took Rinpoche to the airport to continue his North American tour. We look forward to his return soon! Thanks to the many friends who came early and pitched in to make this a successful visit. We couldn’t have done it with you! 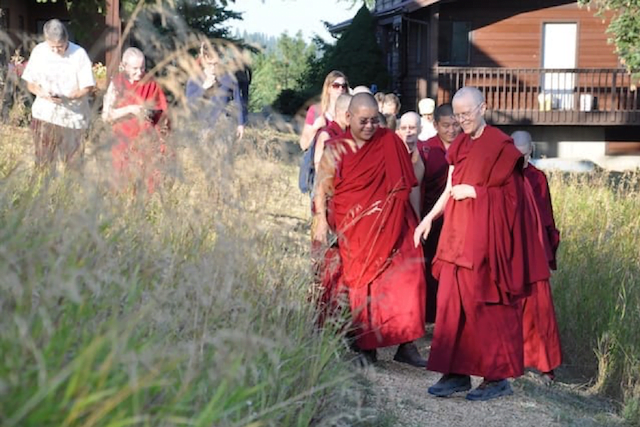 See photos of Rinpoche’s arrival and main teaching. Photos of his tour of Abbey grounds and the talk at NIC are here. 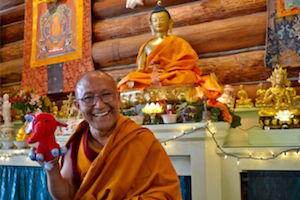 Geshe Dadul Namgyal gave his fourth course at the Abbey, this time on Bodhicitta and the Six Perfections. In fluent English, Geshela inspired us using a slide show of analogies to depict how bodhisattvas dedicate their lives for the benefit of all sentient beings. 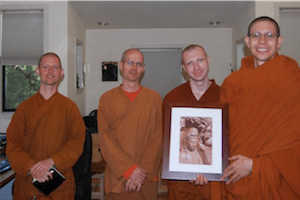 His joy in Dharma practice was obvious, and he invited our questions and comments so that there were “no elephants in the room”—that is, so that our doubts about topics such as rebirth and how to properly keep precepts could be resolved. Geshela was very generous with his time, joining in all Abbey activities, and answering people’s Dharma questions during and after meals. Geshela also spoke to us about CBCT—Cognitively Based Compassion Training, a program at Emory University that he is involved in. Videos of the teachings will be posted next month. Photos are here. 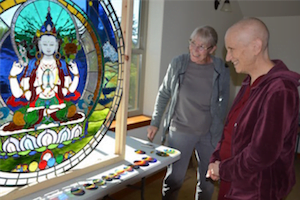 Those of you who have visited the Abbey have seen the two gorgeous stained-glass windows our dear friend Bev has made—one of the Buddha’s step-mother and founder of the nun’s order Mahaprajapati in Gotami House, the other of 1000-Armed Chenrezig in Chenrezig Hall. Well, Bev just offered another beautiful stained-glass window to us—this one of Four-Armed Chenrezig—with over 800 individually cut pieces of glass and over 500 (artificial) sparkling jewels. To the sound of our chanting om mani padme hum, Chenrezig came to rest in his new home in the Kuan Yin room in Chenrezig Hall. We admired Chenrezig both when he was illuminated by the morning sun and by the full moon. May his compassion permeate our minds and the world! Watch Tanya’s talk about how these windows came to be. Ven. Chodron’s trip to India to meet with His Holiness the Dalai Lama to work on the book series, The Library of Wisdom and Compassion, was productive and fulfilling. Together with assistant Ven. Damcho, she also met with several learned geshes who got into long debates in Tibetan about the questions that she raised. Tenzin Tsepak, the translator, was most generous with his time, meeting with the nuns afterwards to translate many of the discussions. Watch for Volume 3 of the Library of Wisdom and Compassion, Saṃsāra, Nirvāṇa, and Buddha Nature, which will be out in January 2019. The nuns also attended the four-day teachings for East and Southeast Asian students, and met with many of Ven. Chodron’s friends from years ago when she lived in Dharamsala, India. Ven. 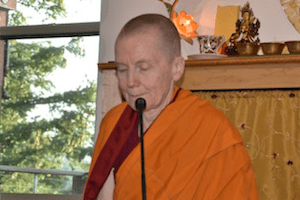 Chodron spoke at Tushita Retreat Center and Jamyang Choling Nunnery in Dharamsala, and Tushita Meditation Center in Delhi. Listen to these talks here, here, and here. Ven. Damcho led her first retreat at Thosamling Nunnery when Ven. Chodron came down with a bad cold. Despite initial nervousness, Ven. Damcho did great! Gonzaga University students from a master’s and doctorate program on Communication and Leadership Studies with a focus on mindfulness spent a day at Abbey. The class of 24 and their professor arrived for the daily Bodhisattva’s Breakfast Corner talk and connected with Abbey residents over lunch. They then spent the afternoon with Vens. Tarpa and Semkye who led a meditation and lively Q & A session before giving a tour of the Abbey. 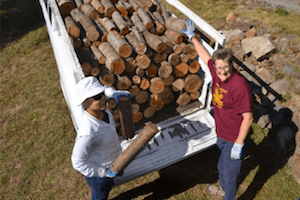 Offering Service Saturday saw only a few volunteers, but together with Abbey residents, they filled the furnace room of Ananda Hall with wood for winter heating. We are grateful for their help and will remember their kindness when we’re warm in the cold winter weather. Sharing the Dharma Day was attended by 30-35 guests, many of them new to the Abbey, including groups from Moscow ID and Whitworth University in Spokane. Ven. Chodron gave the morning Dharma talk from An Open-Hearted Life about the importance of optimism. Watch the talk here. Ven. Tsepal led the thought-provoking discussion groups in the afternoon, which was followed by a tour of the Abbey. One of the visitors wrote us the next day, “Thank you for sharing your day with us all yesterday. It was the first time I have been in the company of people who have similar beliefs. I felt like I was home.” We are glad to be people’s spiritual home and to welcome you to our global community. Canadian company PacWest wants to build a silicon smelter in our local town of Newport. The disadvantages of this plan are many, including potential harm to the health of human beings and wildlife due to air and water pollution. The Abbey is joining many local residents in opposing the construction of the smelter and has attended several meetings about this. We were happy to join our friends, Catholic Sisters Leslie and Nancy, at the meeting in Newport. This article in Spokane’s main newspaper describes the situation. Please join us in writing letters to the Pend Oreille County commissioners and community development director to ask them to stop the proposal. A page on the Abbey’s website gives more information, with updated talking points here and contact info. You can also contact Ven. Samten at the Abbey office for their email addresses. Thank you so much! If you are a Washington or Idaho resident, there’s an easy way to make your voice heard to your local, county, and state officials here. Ling Rinpoche recommended that we recite the “Heart Sutra” and dedicate merit so that the smelter is built elsewhere where there will be no environmental damage or health concerns for human beings or wildlife. Please join us in this practice if you wish. Text and audio are here. Ven. 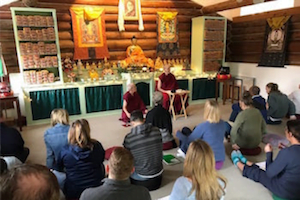 Jigme was invited to teach meditation at a retreat for victims/survivors of sexual assault and domestic violence sponsored by the Family Crisis Network of Pend Oreille County. Six survivors and five staff members attended the retreat. Entitled “The Art of Healing, A Retreat for Women Who Have Survived and Want to Thrive,” the retreat included meditation, yoga, journaling, art, and discussion groups. Ven. Jigme was inspired to witness how the women at Family Crisis Network have been helping women since 1982. Staff members at the retreat modeled asking questions and revealing their thoughts, experiences, and emotions to the group, providing powerful women-to-women support. Ven. Jigme was honored to share meditation techniques with the women and be part of these efforts to empower women and change the culture of victimization of women in the USA. The audio book for HH the Dalai Lama and Ven.’s Chodron’s book Approaching the Buddhist Path is now available. Peter Aronson, one of Ven. Chodron’s long-time students who has a wonderful voice, read it. Check it out here. Tanya, who has been teaching Non-Violent Communication in prisons for years, tells us about the Teddy Bear Project, where inmates make adorable teddy bears that they give to first-responders to give to children whenever kids are involved in emergency situations. Bill Van Court, who is incarcerated in Washington State, did this beautiful painting that he gifted to the Abbey. Read the Abbey residents’ thoughts on the relationship between study, meditation, and offering service in creating a balanced life dedicated to the Dharma. Ken talks about his tendency to be Mr. Fix It when it comes to others’ problems and how he’s realizing he need to “fix” his own way of thinking first.